Julia Levy cradles a patient during a recent Operation Catnip. Once they are anesthetized, the cats are placed on a sheepskin, where they remain as they are carried station to station. The first feline to show up in Vera Williamson’s yard was a tiny gray and white kitten. It was so small, she figured a chicken hawk flying overhead dropped it. She didn’t think twice about putting out a pan of cat food. The kitten’s ornery disposition earned it the name Little Devil Cat, says Kelly Holloway, Williamson’s granddaughter. And before long, Little Devil Cat had a litter. Two years later, Little Devil Cat had her own dynasty, a family at least 30-strong by Holloway’s count. Holloway worried about how much her soft-hearted grandmother, on a fixed income, was spending on cat food. And she worried about how much larger Little Devil Cat’s family could grow. To Holloway, 30-plus cats is a lot of felines. To University of Florida veterinarian Julie Levy, Little Devil Cat’s family is a tiny fraction of the feline population control problem. Levy’s work — as a shelter medicine professor, as a scientist, and as a volunteer — is aimed at solutions to that problem. Operation Catnip takes in up to 250 cats during its monthly clinics. Some people care for large colonies, and it’s not uncommon for a truck to pull up with 20 or 30 free-roaming cats. Levy and hundreds of volunteers show up one Sunday each month to put a dent in the feline population of Alachua County. 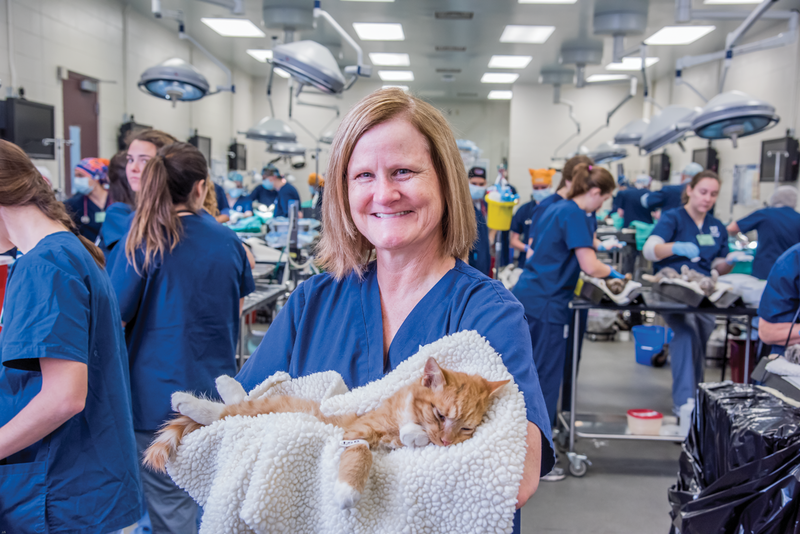 On that day, the College of Veterinary Medicine’s surgery suite is turned into the region’s largest spay and neuter clinic for free-roaming cats. Operation Catnip spays and neuters up to 250 cats each clinic, making Little Devil Cat’s 34 family members a small fraction. 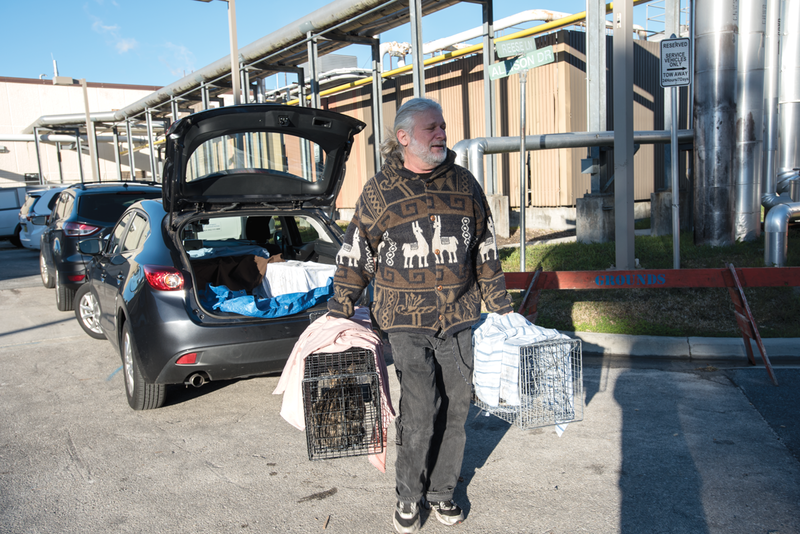 Levy says the 3,500 cats or so sterilized each year could be only 10 percent of the free-roaming population. To know for sure would require teaming up with wildlife ecologists — and a group is getting ready to do just that — to use camera traps and population counting methods more aligned with wildlife science than veterinary medicine. Still, Alachua County has seen success. Since 1998, 55,000 cats have been spayed and neutered and shelter intake has dropped from a high of nearly 6,000 cats a year to 1,984 in 2017. Of the cats taken in that year, 98 were euthanized, and Levy says those were cats whose suffering could not be alleviated or whose behavior would have kept them from being adopted. By one estimate, Levy says only about 25 percent of kittens born free make it to adulthood, so the Operation Catnip cats, in a sense, are the lucky ones. They enter an assembly line, where they get top-notch care, including a medical exam, vaccines, and treatment for parasites. Since they are already anesthetized for spaying and neutering, they sometimes get quick procedures. On a recent Sunday, veterinarians amputated one cat’s infected tail and treated other cats for respiratory infections, matted eyes, fleas and lice. About 100 volunteers show up for each clinic, offering care and compassion at each step for the unwanted felines. A key step in Operation Catnip’s assembly line is the station where veterinary students clip the point of one ear on each cat and cauterize it, marking it as a spayed or neutered cat. When she’s out and about and sees these Operation Catnip graduates scurry across her path, Levy smiles. She doesn’t own these cats, but they are hers nevertheless. Trap-neuter-return (TNR) programs are not universally popular, but they beat the alternative, Levy says. People will not volunteer to bring strays to an animal shelter or participate in a large-scale euthanasia program. But they will volunteer for programs to spay and neuter and return the cats to their environment. “We know what works to reduce colony size, and that’s TNR,” Levy says. She points to a just-published study in which a waterfront in Newburyport, Massachusetts, used TNR to solve its persistent “cat problem.” In the beginning, hundreds of cats roamed the waterfront, which was undergoing revitalization to replace historically industrial properties with tourist-friendly businesses. Conflict over how to manage the cats bubbled over, with some business owners calling for extermination, and others wanting to save the cats. Levy is working toward the day when Operation Catnip and its army of volunteers is not needed. Spaying and neutering hundreds of cats, even assembly-line style, is a sledgehammer solution. She is looking for a precision tool, like a vaccine. immunodeficiency virus. But it wasn’t long before the thorny problem of managing community cat populations took over her research time. There had to be a better way, she thought, to control cat populations. After intake, the community cats are anesthetized, then taken through an assembly line, where they get exams and vaccinations. Their ears are “tipped,” which marks them as Catnip cat. Contraceptive vaccines worked in some wildlife populations; would they work in free-roaming cats? One study on seals in Nova Scotia caught her eye. A burgeoning seal population was depleting the fisheries, so fishermen looked for a way to control seal reproduction to give the fisheries a chance to recover. Seals injected with a single dose of a vaccine targeting zona pellucida, the outer coating of eggs in the ovaries, did not produce offspring for an average of six years. “That was appealing to us. We aren’t going to see these cats more than once, so something that lasts a long time or forever is ideal,” Levy says. “So we established a cat research colony, vaccinated them, and put them in a breeding trial. Still, that experiment was valuable because it answered her question quickly. On to the next vaccine. This one, GonaCon, worked well in horses and wolves, blocking GnRH, gonadotropin-releasing hormone, in the brain. Levy thought this vaccine might provide a benefit in addition to contraception. Hormones play a role in feline nuisance behavior, such as spraying, wailing and fighting, so a vaccine that shut down the hormones would be a “golden combo” of fertility and behavior control. The results were promising. All of the cats responded to the vaccine, and half were contracepted for more than three years. After five years, a remaining handful were still kitten-free after just one injection, so they were spayed and put up for adoption. The results were not the 100 percent cure that spaying and neutering is, but were promising. Would the vaccine work in community cats? This time, instead of using a research facility, Levy worked with an international team of experts from the Alliance for Contraception in Cats and Dogs to design a study that would mimic a more real-world scenario in which stray cats at risk for euthanasia in animal shelters were rescued, brought back to good health, and then housed in a large indoor/outdoor pen that mimicked a free-roaming lifestyle. Again, all the cats were adopted when the studies were completed. This time, however, a higher proportion of the cats became pregnant. Fertility is a real challenge, Levy says, because the body naturally protects fertility. In addition to overcoming the reproductive success of cats, vaccine delivery methods also present some challenges. While she might be willing to use a less-effective vaccine like GonaCon to gain ease of delivery — in a bait, for instance — delivery of the bait would be tricky. Just putting it out behind the barn leaves it open to non-target species. The hormone targeted by the GonaCon vaccine is identical to the hormone in humans and other creatures. “You wouldn’t want a Florida panther or a child consuming contraceptive baits,” Levy says. For some species, the delivery issue has been solved. Feral pigs, for example, are contracepted with oral baits, but the specially designed bait station is heavy and tricky. Only pigs are strong enough or smart enough to open it. Until a similar solution is developed for cats, capturing them for an injection looks like the most practical alternative. They can be injected in their traps and immediately released, a much quicker undertaking than processing them through a spay/neuter clinic. Levy says she is disappointed but not shocked that existing contraceptive vaccines didn’t work like she’d hoped. But a new development may accelerate research in her field, and she welcomes it. The Michelson Prize in Reproductive Biology offers $25 million for innovation in non-surgical sterilization for cats and dogs, and the Michelson Grants in Reproductive Biology offer up to $50 million in grant funding for research on non-surgical sterilization for cats and dogs. With incentives like that, Levy says, lots of researchers who had ignored the plight of animals to focus on other endeavors may be willing to tweak their research to see if they can come up with a new approach to feline contraception. While sterilization programs like Operation Catnip work well, they are expensive and require infrastructure. Money and facilities are in short supply globally, so a vaccine or bait would accelerate humane solutions worldwide, Levy says. Levy points to a picture on her wall, showing a temple in Tibet that has been turned into a spay/neuter clinic, with volunteer veterinarians performing the procedure against a backdrop of religious tapestries. Senior veterinary student Maxie Bowen has volunteered at Operation Catnip for four years. She has successfully completed the sophomore surgery lab and externships in a spay/neuter practice and a shelter, so she’s eligible for the Sunday spay and neuter rotation, where she can practice her surgery skills. For Bowen and students like her, there’s a lot of education packed into an Operation Catnip Sunday. “Doing an exam on a cat is really challenging, but here, they’re asleep, and that gives you a chance to do a really good physical exam and learn as a student. I’ve seen so many weird things you normally would not see at all. The cats that come through here live on the streets, so they’re not like a cat that is someone’s pet,” says Bowen, who came to vet school with one dog and now has four dogs and two cats. One of the barriers to compassionate care for unwanted animals is the nationwide shortage of veterinarians in shelter medicine, Bowen’s field. Levy gets a couple of requests a week from shelters across the country asking for help in finding a veterinarian. Julie Levy, left, is conducting research on contraceptive vaccines for cats. Until that work succeeds, she performs spay and neuter surgery each month at Operation Catnip. Levy says all veterinary students nationwide use a common portal for applications, making it possible to survey their interests. A survey of applicants for the class of 2020, today’s sophomores, asked them to rank the practice in which they were most interested. Companion animal was first and second was shelter medicine. That effort got a boost in 2008, when UF won an $11 million grant from Maddie’s Fund and launched Maddie’s Shelter Medicine Program. Maddie was the beloved Miniature Schnauzer of the program’s benefactors, Dave and Cheryl Duffield, and Levy became the Maddie’s Professor of Shelter Medicine. Most veterinary schools have a course or a rotation in shelter medicine. But at UF, shelter medicine is a detailed and comprehensive curriculum covering all levels of shelter medicine, from the health of individual animals to the health of the shelter population as a whole. 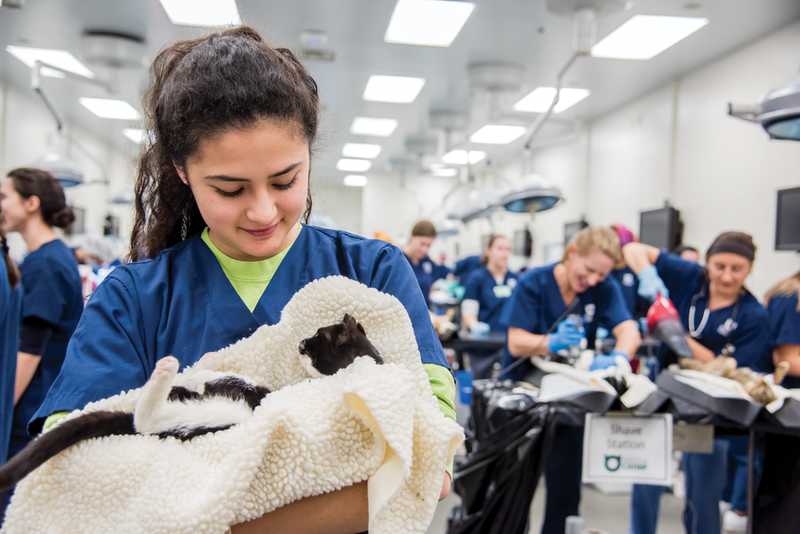 That is coupled with an externship program, where students are placed in shelters for hands-on experience alongside practicing shelter veterinarians. 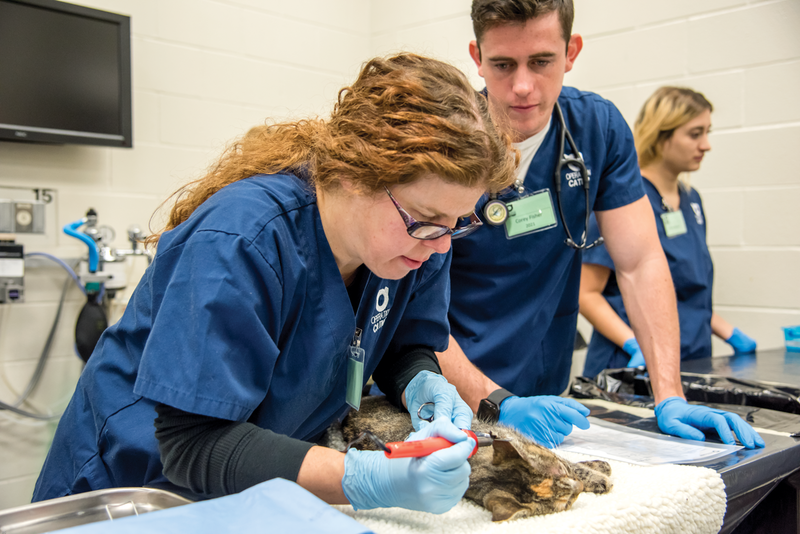 In addition, clerkship programs give students the opportunity to practice shelter care, spay-neuter, and care for pets of low-income pet owners under the direct supervision of a UF faculty member. While the facilities at the college’s teaching hospitals are among the best in the world, work in resource-scarce conditions requires an adaptive approach. It’s important, Levy says, to take students outside the ivory tower. “At UF’s specialty referral hospital, where we get referrals from referrals, animals come for very elaborate care. The complicated caseload that comes through our hospitals is superb for training future specialists, but not always representative of what students will face every day in shelters or general practice,” Levy says. “The rotations in shelters give them a chance for a high-volume primary care experience with examinations, common illnesses, and behavioral care. 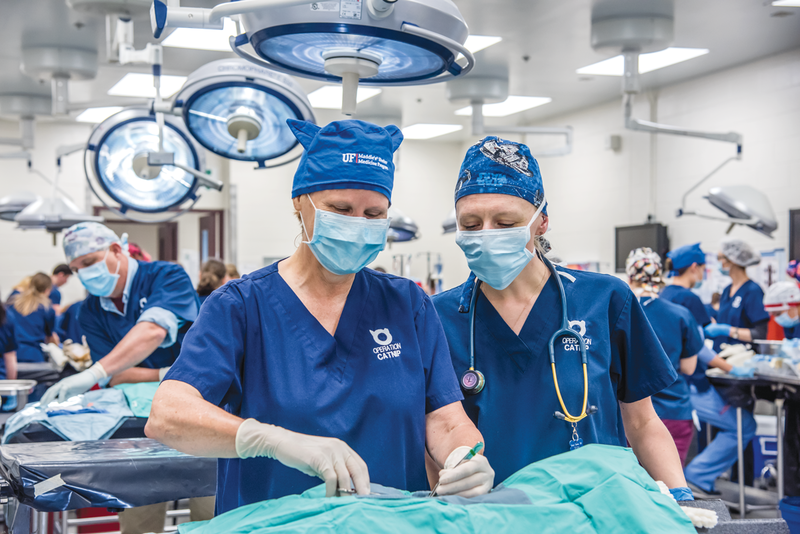 Spay-neuter is becoming one of the best ways to teach surgery skills. The secret sauce is training that empowers students to take a leadership role in shelter management, including development of protocols to protect the entire shelter population, investigating cruelty cases, and making hard choices about how lean budgets can be stretched to accomplish the most good. Among the unique courses is a class in compassion fatigue strategies. Compassion fatigue is an issue in veterinary medicine in general, but it is amplified for shelter veterinarians, with long hours, a huge and unpredictable caseload, and the sometimes-wrenching condition of the animals they see. Loss of work-life balance is common, as is exhaustion and burnout. Levy’s fur family includes three dogs and two cats. She prefers a dog that is cat-like, and she says her greyhound fits that bill, mellow and cuddly and low maintenance. She has another dog who got lucky at an adoption event. The pup came home for “overnight monitoring,” seven years ago, and never left. He is wobbly now, but can walk. Growing up, she had dogs and horses, but now, she says, she’s a cat person, although these days, she is down to two, both retirees from her contraception research. They did a good job for her; she gave them a home. Levy says she reached peak pets with 12: six former research cats, her own three cats, and three dogs. Even as a veterinarian and card-carrying animal lover, “that’s more animals than I want to live with again,” Levy says. The six research cats were hangers-on after an FIV project. They were no longer needed, but they had to be cared for, and upkeep was becoming expensive. Their lab mates had all been adopted, but there were no takers for these six. While they could have been euthanized, Levy could not do it. Too expensive to keep at the lab, too sweet to euthanize, she took them home. The solution to feline overpopulation will come from science, she says, whether her lab or others. She stays in touch with a shelter medicine graduate now working in Southeast Asia, where there is no Operation Catnip. Locally, in the winter, when shelter populations drop, Levy relaxes, but just a bit. She knows kitten season is coming.